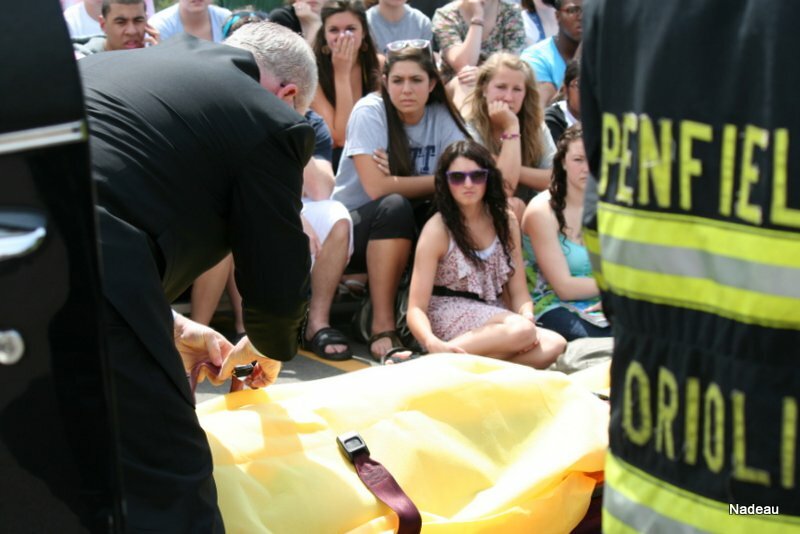 One bad decision can send a wide ripple of consequences, affecting family, friends and emergency responders, a mock driving while intoxicated crash demonstrated to Penfield's junior class Thursday morning. As juniors prepare for their prom Saturday, school officials, student actors, police officers and the Penfield volunteer fire department played out in front of them what a driving while intoxicated accident may look like. Monroe County Sheriffs narrated the scene, describing the two-car accident as a possible result of drinking and driving after students left a party. Students gathered in the gym after the mock accident and were given time to ask questions. Sheriffs spoke to them, urging them to consider the effects of their decisions on not only their lives and the lives of their families and friends, but the emergency crews that respond to DWI accidents. They stressed that alcohol and drugs aren’t the only things that can lead to devastating accidents. Using a cell phone while driving can be just as deadly, he said, adding that a driver taking their attention off the road for as little as two seconds can double the risk of getting in an accident.